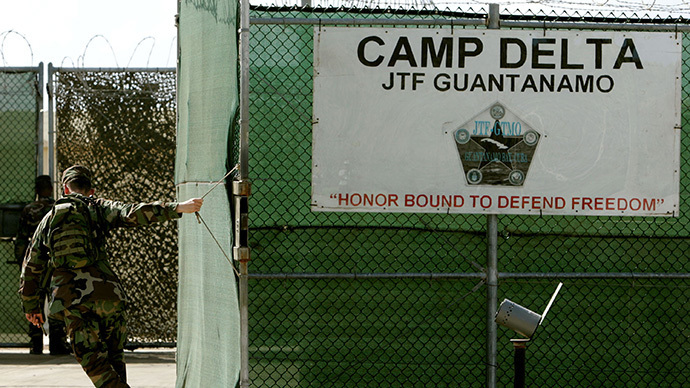 The latest decision by the Washington DC federal appeals court has become a temporary defeat for the Obama administration, seeking to block the release of several “extremely disturbing” videos showing force-feeding of restrained Gitmo inmate. In the federal court’s eight-page decision on Friday, the three-judge panel reasoned that it was “without jurisdiction” to issue orders at this point. “We cannot reach the merits of this appeal…because it is premature,” the panel wrote. The decision leaves the matter with the trial judge, the appellate panel explained, and could also yield several benefits. “It is possible that appropriate redactions will limit the scope of, or perhaps eliminate altogether, the government’s concerns over release of the videotapes,” the appellate panel speculated. The case involves Syrian native Abu Wa’el Dhiab, 43, who was held at Guantanamo Bay from 2002 until his release to Uruguay in December 2014. Dhiab was cleared for release in 2009 but remained held at the prison. He protested with other detainees and initiated a hunger strike in early 2013, prompting the force-feeding. The District Judge Gladys Kessler rejected the government’s arguments that the tapes are classified and releasing the videos would harm national security and “inflame Muslim sensitivities overseas,” and ordered the videos be made public, with redactions to protect the identity of Guantanamo guards. The government appealed that decision. Sixteen media organizations including The Intercept, McClatchy, The New York Times and The Washington Post have intervened in the case to press for the release of the videotapes, all 32 of them, which span about 11 hours.